Stamping Saturday- Gradient Love Birds | Polish Me, Please! It’s stamping Saaaaaaaaaturdaaaay!!! (Oprah voice) Today I’m going to my cousin’s baby shower so I wanted to do something babyish. They aren’t finding out the gender of the baby, so I couldn’t really go all pink or all blue, so I decided to try gradient stamping and do pink to blue. Also, I ended up not doing anything too babyish and went with love birds instead. 🙂 It’s a coed shower so most likely no one will even notice my nails, but oh well… I’ll know they’re cute! 😉 Let’s see em! •Top with SV and allow your nails to dry thoroughly. •When your nails are dry, apply Konad Special Pink to the bottom half of the stamp on BM H17 and SH Insta Dri Brisk Blue to the top half. •Quickly scrape the excess off several times, moving the scraper up and down on the image to mix the colors a little. It’s ok to be sloppy, just make sure your final scrape is clean. •At this point your colors should be a little smeared and gradient-like, so pick up that image with the stamper and quickly place on your nail. •Apply your topcoat and repeat on all of your nails. Don’t forget to check out everyone else’s awesome stamped nails using the button below!! Have you tried gradient stamping? If you have any tips for me, leave em in the comments below! As always thank you all so much for reading and commenting and till next time- Happy Polishing! Whoa whoa whoa… You don’t like hearts?? I didn’t know that! I am a bird hater like Cynthia but I love this stamp, too. I like cartoons of birds just fine. 😉 Thank you! Thanks!! I need work on the gradient part, but hey- I was mostly happy w these!! I heart this so much. It’s amazing. 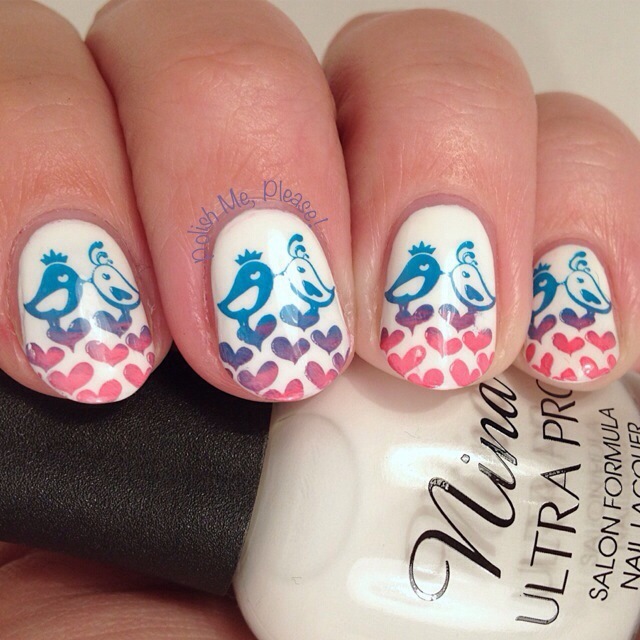 You know I’m not happy about the bird part, but the stamping is flawless and I love the gradient aspect to it. Good show! It was hard for me to look past the birds, but I did. Such a thoroughly brilliant idea to stamp blue & pink for a shower when you don’t know the kid’s gender! Thanks! I could have done yellow nails I guess, but these seemed more fun. Glad you liked them! I love them! They’re just adorable and very eye-catching! I meant to comment on this ages ago, but I love this! Super pretty and perfect for a baby shower! Love it! Thanks! I really liked them too. I need to play around more with gradient stamping.